I do know a couple of names from the basketball scene, mostly due to our March Madness success, but the name of the coach is not one of them. I also don't feel like googling it. 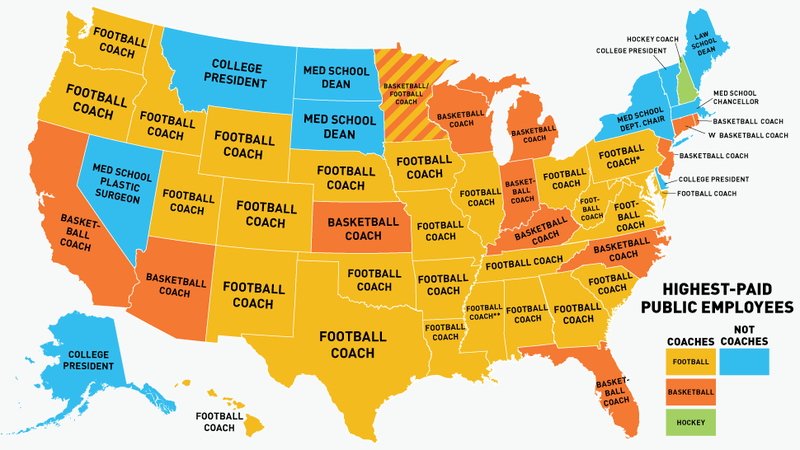 Michigan is one of forty states that has a sportsball coach on top. I guess because most sportsballs are highly lucrative. The most divergent state is Nevada. Med School Plastic Surgeon seems pretty open to interpretation. I envision someone who gets paid to make med students faces more symmetrical. My guess is that this person is actually Tom Izzo, head coach of MSU. Yeah, the sports ball people at my house say it's Tom Izzo.